There's an old saying that says you can't please everybody. The same can be said about holidaying with family, but in order to keep tears and tantrums to a minimum it's important to know everyone's wishes before the adventure begins. But with so much advice around on the best way to achieve family holiday harmony, just who are you supposed to listen to? It's important to establish from the outset what everyone has in mind for the holiday to avoid any misunderstandings further down the line. Involve the kids in the preparation by letting them help with packing and include them in checking in online and booking parking in advance. Not only will staying in an apartment save you money but it will also help keep stress levels down. Away from the hustle and bustle of the inner city hotel you can move at a comfortable pace that suits you. It's important to have some down time on your holiday away from all the scheduled activity. Keep the little ones occupied by bringing some home comforts along with you, like their favourite toys or books. It's hard to hold the imagination of a child at the best of times. To avoid restlessness on the long uneventful plane or train journeys ask them to keep a travel diary of their experiences. Be prepared to change your plans at any time. That trip to the zoo you had planned for the final day is not the best place for exhausted children. 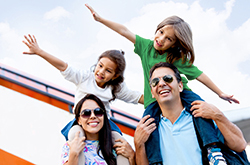 Care to share your thoughts on the best ways to cope when travelling with kids? Leave us a comment on our Facebook page.